I like to spend time with my brides and grooms explaining how their wedding ceremony works, because every wedding ceremony has a structure. In addition, every wedding ceremony has three things in common, the same things your Cayman wedding ceremony has in common with William and Kate's Royal Wedding Ceremony. This is because how the wedding structure is set down by law, and our Cayman Is Marriage Law is based on English Common Law. The Wedding Ceremony starts with a welcome and introduction: I welcome the guests even though there might only be a few, and say why we are there. Then I say a few words about marriage. Because I am a Civil Registrar, I do not mention God, or religion, unless you have specifically asked me to. Nevertheless, I talk about how important marriage is as an institution, and the solemnity of it. Marriage is not a condition to be entered into lightly or with frivolity. The Question: The Archbishop Of Canterbury said to Prince William and Catherine, " I require and charge you both, as ye will answer at the dreadful day of judgement when the secrets of all hearts shall be disclosed, that if either of you know any impediment. why ye may not lawfully be joined together in Matrimony, ye do now. confess it. For be ye well assured, that so many as are coupled together otherwise than God's word doth allow are not joined together by God; neither is their Matrimony lawful" The Civil version I am required by law to use in my ceremony, does not make use of such flowery language, but the intent is the same, "I am required by law to ask if either of you know any reason why you may not be lawfully married to each other you should now declare it." This sometimes results in nervous giggles but you are not supposed to say anything, unless of course you have something to confess, like a previous spouse. The Solemnisation of the Marriage: Otherwise known as the "I do's" or the Vows of Intention William when asked the question, "Wilt thou have this woman to thy wedded wife..." answered "I will". This is the second question the marriage officiant must ask directly to the Groom first, and then the Bride. This question must be answered, and in the Civil Ceremony, I must hear you say "I do". This is an indication that you come to the marriage of your own free will, and without coercion. You cannot shake your head, or say yes, unless it is followed by "...I do". The Wedding Vows: Taking Catherine's right hand, William said the following after the Archbishop, " I, William Arthur Phillip Louis, take thee, Catherine Elizabeth, to my wedded wife, to have and to holdfrom this day forward, for better, for worse, for richer, for poorer, in sickness and in health, to love and to cherish, till death us do part, according to God's holy law; and thereto I give thee my troth." In my contemporary wedding vows, most of the above is covered. Catherine eschewed the word "obey" in their wedding vows, and most modern brides dispense with this concept as well. 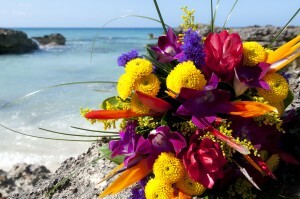 Now, Cayman Islands law does not require you to say wedding vows in a civil ceremony, but nontheless I have various vows you can use or you can compose your own vows. (I had one groom compose his vows and read them off his hand-held device!) Very few couples choose to commit their vows to memory, as the excitement of the day could easily make them forget. Most brides and grooms are content to repeat their vows after me. Notice the formality of the Bride and Groom using their full given names. In my opinion, even in your Civil ceremony you should use your legal, given names as befitting the seriousness of the occassion. The Ring: Couples ask me all the time if they have to use rings. No, you dont. 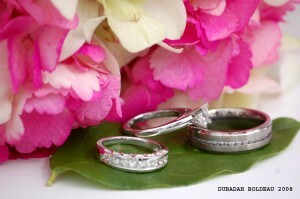 However more than 95% of my couples do, and the double ring ceremony has become the most popular. At the Royal Wedding only Catherine got a ring. Did you see where her engagement ring was? Many, many brides want to know what to do with their engagement ring on their wedding day. If it can fit on your right hand, put it there. You can always have it join your new wedding ring when you have finished signing the Register. You could also give it to your attendant or witness to hold, it will only be a few minutes before you get it back. This question of what to do with the engagement ring has resulted in a new phenomena, the Groom sometimes put the wedding ring followed by the engagement ring on his Bride's finger. This is what William said to Catherine when he put the ring on her finger " With this ring I thee wed, with my body I thee honour, and all my worldly goods with thee I share..." In the Civil version I use, the words frankly aren't as beautiful, but you would say "I give you this ring, as a token and pledge...(and here you can get inventive)". Most people use the words I provide "...of my constant love and fidelity." The Pronouncement: This is the big moment, the moment when every Bride and Groom feels their breath catch in their throats. These are the words that William and Catherine heard " Forasmuch as William and Catherine have consented together in holy wedlock, and have witnessed the same before God and this company, and thereto have given and pledged their troth, either to the other, and have declared the same by giving and receiving of a ring, and by jpoining of hands; I pronounce that they be man and wife together, in the name of the Father, and of the Son, and of the Holy Ghost, Amen." But I say, "Ladies and gentlemen, in our presence here today ( Bride) and (Groom) have pledged themselves to each other. May these two persons keep the vows that they have made. Now in accordance with the laws of the Cayman Islands and by virtue of the authority vested in me, I now pronounce you to be husband and wife." So, that takes care of all the parts of the Ceremony required by law. The Registers: At the Royal Wedding, the bride and groom signed three Registers, we did not actually see this because they went into another room with their witnesses. However, we know that they would have had to have at least two witnesses over the age of 18 years, as you will when you get married in the Cayman Islands. One of the Registers is given to you, as a certified copy and your record of the event. One copy goes on my Marriage Book as my permanent record of your wedding. ( This is why I tell you if you ever use your marriage certificate you can write to me and I will get you another one) and the other, I file with our Registrar General at our public records office. If you were married as a visitor, that is by Special Marriage License, my responsibility as your Marriage Officer only ends when I have obtained your Registered Marriage Certificate and mailed or otherwise delivered it to you. This should only take a few days. This RMC is your proof that you were legally married in the Cayman Islands, and you should keep it safe with your own important papers. Of course, I add a few more embellishments to the ceremony, because it has become tradition to have The Charge, The Kiss and the Announcement of the new couple. 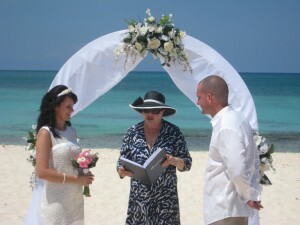 In the body of the ceremony you can also add one or two readings. But, my Civil Ceremony is 12 minutes long!